Every drop counts: our partnership with FRANK Water. In the UK over 3,100 million litres of water is sold in plastic bottles each year. That’s 4.7 litres per person in the UK. Compare that to the 663 million people in the world who don’t have access to safe water. We think it’s a problem, and together with our partner FRANK Water, we want to do something about it. FRANK Water is a charity dedicated to improving the lives of many across the world, focusing on providing access to safe water, sanitation & hygiene in India and Nepal. By selling water bottled in recyclable glass bottles and donating 100% of the profit FRANK has raised over £102,537 amount for their cause. Pretty good going. So what does all this have to do with pie? 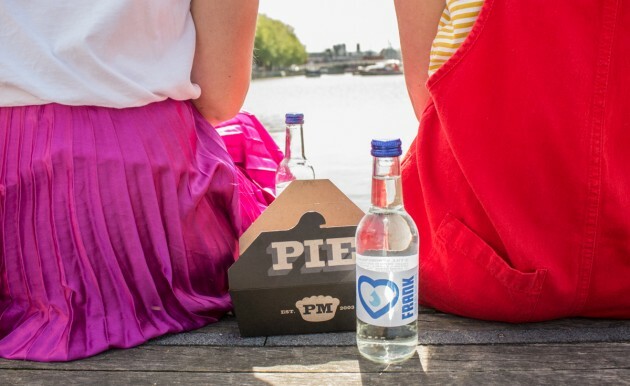 Well, strictly nothing, but it does involve you and the drink you have with your pie. With the launch of our Summer Menu, we will be serving FRANK bottled water and banishing plastic bottles from our pie places, with all profit going to safe water programmes across the world. And we’re doing a drop more. We’ll also be supporting FRANK’S DRINK ME:SAVE LIVES initiative which enables those of us with a safe, sustainable water supply to help those without. For every table to drink tap water, we’ll be adding a discretionary 75p donation to your bill, with every single penny going directly to FRANK Water. We’ll be keeping track of how your donations mount up which will be sure to help thousands have safe, clean drinking water. So, keep an eye on our social media channels for updates, and please do donate. Every penny truly does count.